Brianna is the Maker Mama and Designer behind Life and Yarn who always has her coffee in one hand and her hook in the other! You can find her dreaming up new designs and ways to contribute to this community in a meaningful and positive way all while sitting cross-legged on the floor with her little guy! Brianna loves texture, exciting stitches and is on a mission to bring you one of a kind crochet designs! Hey Fellow Hook Nookers! Brianna here again, the Mama Maker and Designer behind Life and Yarn! You can come follow me on Instagram @life.and.yarn for what I am working on daily! I am so excited to be bringing you another brand-new project to THN Blog!!! Crochet has been something that I have picked up and put down countless times my entire life, but now it is really becoming my life!!! I believe my crochet calling is to bring you modern and chic crochet designs! You can come check out more of my work later on my blog. I am truly a creative at heart and nothing makes me happier than to see all of you enjoy making pieces that I feel are a part of me! It makes my heart so full when this amazing community gets excited about a project that I have poured my heart into! This journey has been so amazing, and I am so happy to have you all be part of it and for me to be part of yours! Previously on THNB I brought to you the Reverie Ruana. I didn’t think I could make something that I loved that much, maybe even more… Have you ever designed something or come across a design that you can see yourself wearing for just about any occasion? 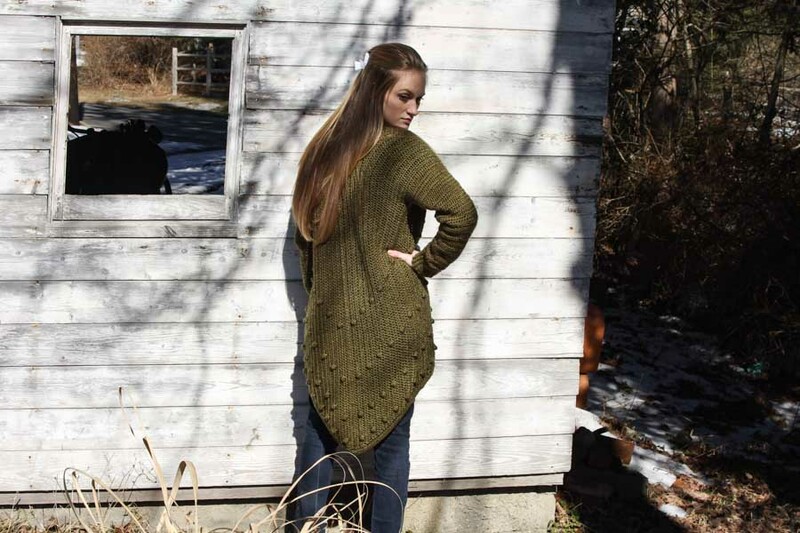 That’s how I feel about my newest design, the Beverly Cardigan!!! I want to wear this cardigan daily around the house, to run errands, to a casual lunch, holidays, all of it! I love the simplicity of this design but also its uniqueness! I really think this may be my favorite project to date! I cannot wait to see all of you lovely makers get making! Chain Stitch - CH – yarn over, pull yarn through stitch on hook. Slip Stitch - Sl St – Insert hook into stitch or space, yarn over, pull yarn through both loops on hook. 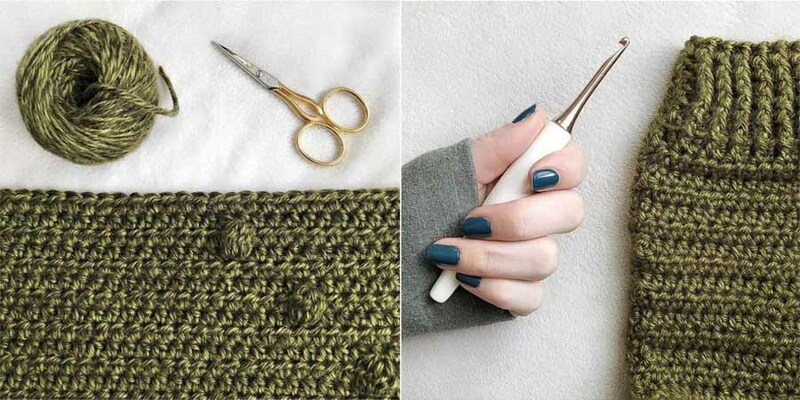 Half Double Crochet - HDC – Yarn over, insert hook into stitch or space, yarn over, pull up a loop, (3 loops on hook), yarn over, pull through 3 loops on hook. Bobble Stitch – BO - Yarn over, insert hook in next stitch, yarn over, pull up a loop, yarn over, pull through two loops (2 loops on hook) yarn over, insert hook in same stitch, yarn over, pull up a loop, yarn over, pull through two loops (3 loops on hook) yarn over, insert hook in same stitch, yarn over, pull up a loop, yarn over, pull through two loops (4 loops on hook) yarn over, insert hook in same stitch, yarn over, pull up a loop, yarn over, pull through two loops (5 loops on hook)Yarn over, and draw through all loops on hook. Continue to next stitch. * * - Designates a repeat. XS/S (M/L, XL, 1X) – Use corresponding number for your size. Chain 2 does NOT count as a stitch in this pattern. FHDC 200 (200, 210, 220) CH 2 and turn. HDC 2 TOG (decrease st) HDC 197 sts, 2 HDC in last stitch (increase st) CH 2 and turn. 2 HDC in first stitch (increase st) HDC 197 (197, 207, 217) sts, HDC 2 TOG. CH 2 and turn. 200 (200, 210, 220) total sts. HDC 2 TOG, HDC in next 3 sts, BO, HDC in next 9 sts, BO, HDC in next 14 sts, BO, HDC in next 19 sts, BO, HDC in next 100 (100, 110, 120) sts, BO, HDC in next 19 sts, BO, HDC in next 14 sts, BO, HDC in next 9 sts, BO, HDC in next 2 sts, 2 HDC (increase st) in last Stitch. CH 2 and turn. 200 (200, 210, 220) total sts. Repeat Rows 4-7 finish off. FHDC 200 (200, 210, 220), CH 2 and turn. 2 HDC in first stitch (increase st) HDC in next 2 sts, BO, HDC in next 9 sts, BO, HDC in next 14 sts, BO, HDC in next 19 sts, BO, HDC in next 100 (100, 110, 120) sts, BO, HDC in next 19 sts, BO, HDC in next 14 sts, BO, HDC in next 9 sts, BO, HDC in next 3 sts, HDC 2 TOG (decrease st) in last Stitch. CH 2 and turn. 200 (200, 210, 220) total sts. 2 HDC in first stitch (increase st) HDC 197 sts, HDC 2 TOG. Chain 2 and turn. Repeat Rows 2-5 finish off. Lay Panel A to your left and B to your right, flat with the right sides up creating a mirror image of each other. 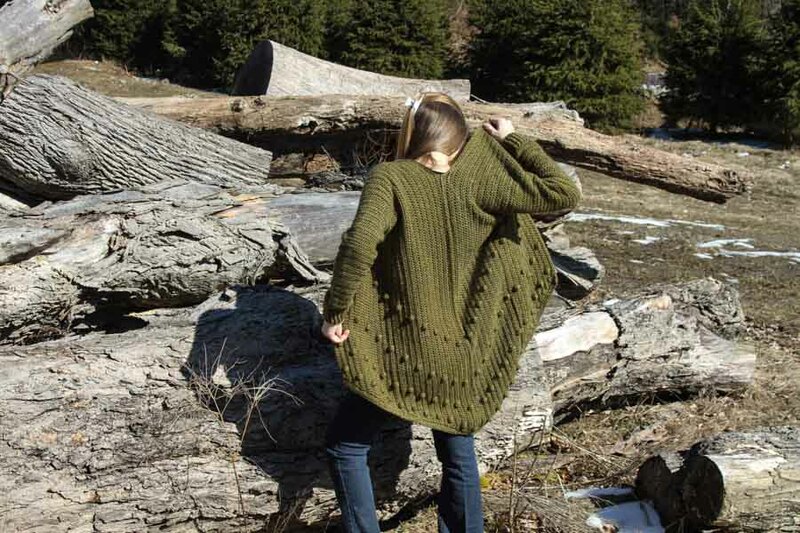 The furthest most point is the center back of the cardigan, and should be closest to you. Using a flat zipper seam, start at the center back and work up 115 (115, 120, 125) stitches toward the middle of the panels. 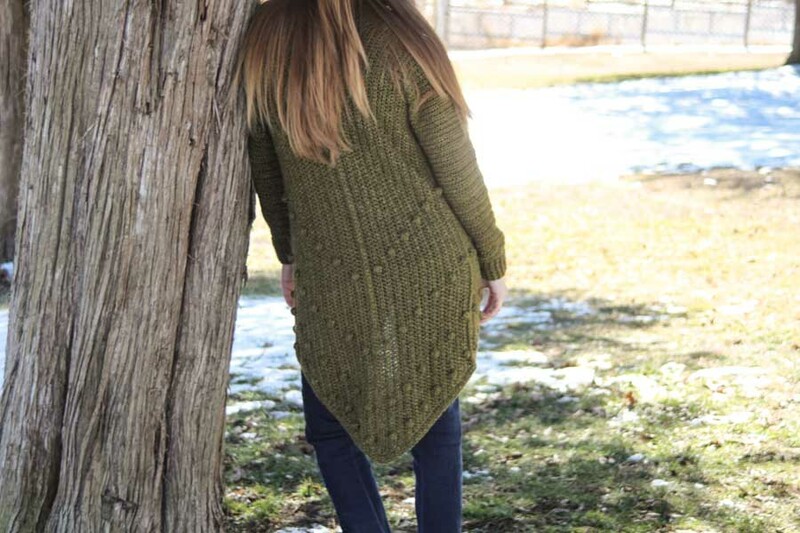 Fold your cardigan in half and align the sides to create a smooth angle along the bottom edge. Starting at the bottom edge and working your way up towards the armpit, use a flat Zipper seam up 75 stitches. Finish off OR CH 2 to begin your sleeves. Decrease rounds may not be full repeats. HDC 50 (50, 60, 70) sts, Sl St together. Chain 2, turn, HDC 50 (50, 60, 70) sts, Sl St together. Chain 2, turn, *HDC 8 sts, HDC 2 TOG* repeat to end. 45 (45, 54, 63) sts. Sl St together. Chain 2, turn, HDC 45 (45, 54, 63) sts. Sl St together. Chain 2, turn, *HDC 8 sts, HDC 2 TOG* repeat to end. 41 (41, 49, 57) sts. Sl St together. Chain 2, turn, HDC 41 (41, 49, 57) sts. Sl St together. Chain 2, turn, *HDC 8 sts, HDC 2 TOG* repeat to end. 37 (37, 45, 53) sts. Sl St together. Chain 2, turn, HDC 37 (37, 45, 53) sts. Sl St together. Chain 2, turn, *HDC 8 sts, HDC 2 TOG* repeat to end. 34 (34, 41, 47) sts. Sl St together. Chain 2, turn, HDC 34 (34, 41, 47) sts. Sl St together. Chain 2, NO turn, FP/BP HDC 34 (34, 41, 47) sts. Sl St together. With right side facing you, attach your yarn with a Sl St to the bottom corner so that you can work up towards the neck. Work 1 HDC where your joined and then HDC in each stitch up the side to the neck seam, place 1 HDC in the neck seam and then work back down the other side to the other bottom front corner. Place 3 HDC in the bottom corner, and work evenly in HDC down the bottom edge to the back-center point. Place 3 HDC in the back point and then work in HDC even back to where your originally joined your yarn. Sl St to the beginning, CH 2, turn and HDC evenly back down to the center back point. Place 4 HDC in the 2nd of the 3 HDCs you placed in the point of the last round. Work in HDC evenly back up to the other front bottom corner. My maker journey has been nothing short of amazing and I am so thankful for this maker community! Finding my direction and purpose has really allowed me to step into the Maker I want to be. I have so many plans for Life and Yarn, you being part of the journey is one of them, thank you so much for all of your support and encouragement! Please be sure to follow me on Instagram @life.and.yarn for my daily wips and also on my Facebook Page, Life and Yarn Designs!